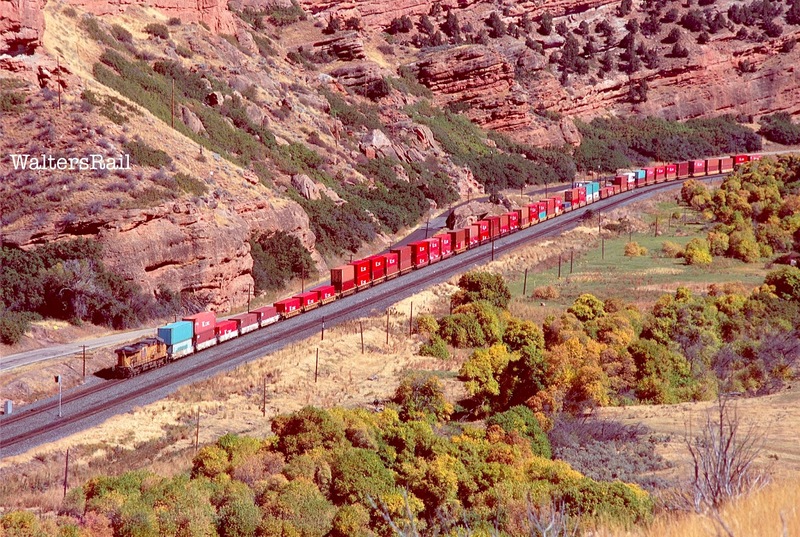 “In front, the eye runs down the bright red line of Echo Canyon. Twin lines of bluffs, a succession of buttresses all fretted and honeycombed, a double row of steeples slipped from perpendicularity, frowned at each other across the gorge. “The most formidable section of the canyon was surmounted on the west by high perpendicular ledges of rock immediately overlooking the road, with cliffs on the east very high and difficult of ascent. The starting point of Burton's tour was St. Joseph, Missouri. His stagecoach followed the Pony Express route through Salt Lake City to San Francisco. Burton's travels were reported in The City of the Saints and Across the Rocky Mountains to California, originally published in 1861, providing detailed accounts of the Pony Express stations that he visited in October 1860. Early efforts to find a route across the Great Salt Desert were foiled by heat and lack of water and forage. Eventually, a trail was discovered that skirted the worst of the desert, going from spring to spring, "following the moistures". The route was isolated, muddy in spring and fall, dusty and hot in summer, dusty and cold in winter. 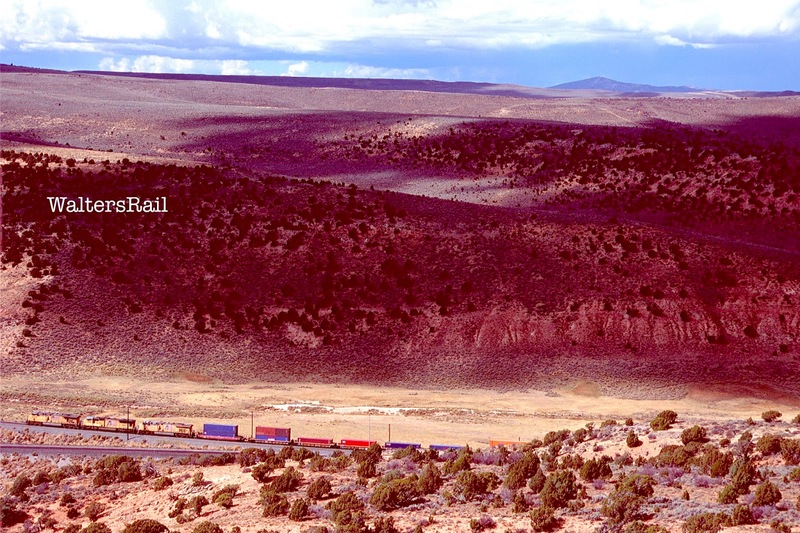 This became known as the Overland Route, which was followed by the famed Pony Express. The route of the Pony Express angled south and west across Wyoming, crossing the Western Continental Divide at South Pass on a grade so shallow that you wouldn’t know you were crossing the Divide unless someone told you, then across the Green River and on to Fort Bridger. The trail continued at a distance south of what today is Interstate 80 and crossed the foothills of the Uinta Mountains at Aspen Mountain in Wyoming, a location that even today is so inaccessible and remote that you can only drive to it on minimum maintenance roads requiring sturdy four-wheel-drive vehicles with high ground clearance. 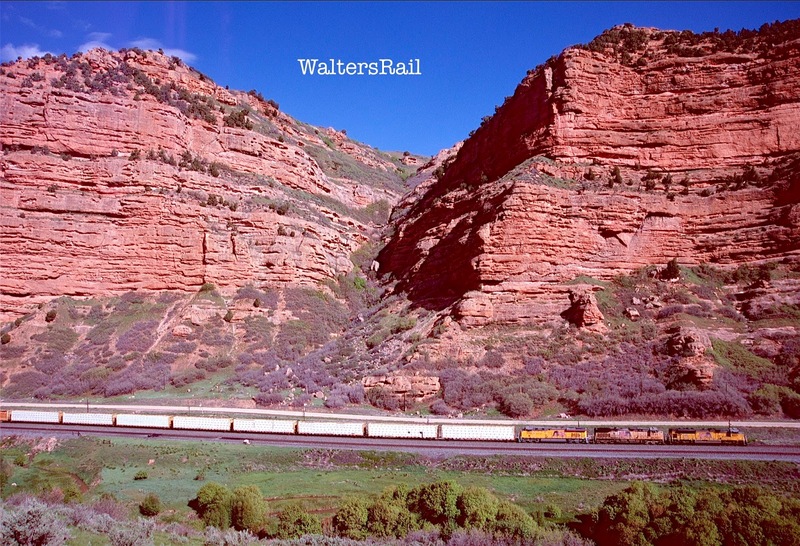 The Union Pacific followed the Pony Express route in far southwest Wyoming and tunneled beneath the mountain at Aspen Tunnel, then entered Utah and followed Echo Canyon and the Pony Express Riders downgrade to the Great Salt Lake. 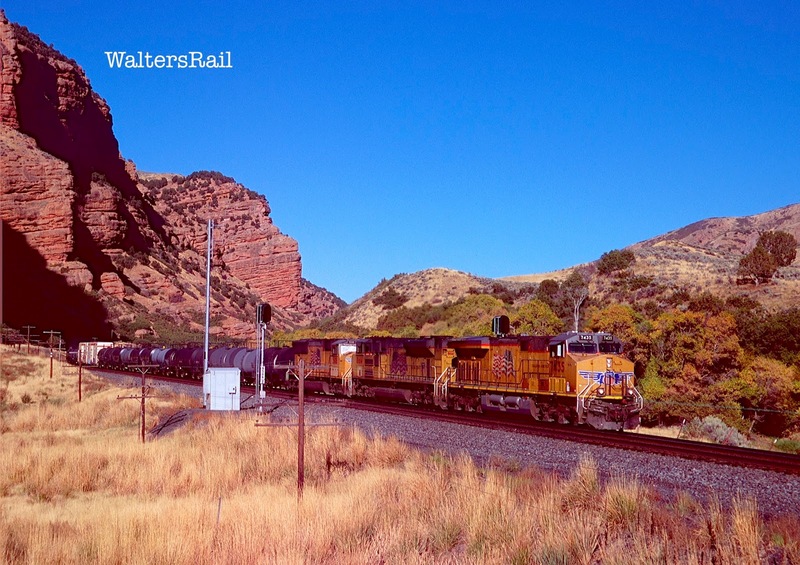 Some of the most spectacular scenery on the UP can be found from Aspen Mountain through Echo Canyon. After examining this post, perhaps you will agree. “Away to the south, the Uinta Mountains stretch in a long line; high peaks thrust into the sky, and snow-fields glittering like lakes of molten silver; and pine forests in somber green; and rosy clouds playing around the borders of huge, black masses; and heights and clouds, and mountains and snow-fields, and forests and rocklands, are blended into one grand view." Diary of John Wesley Powell, May 24, 1869. The area occupied today by the Uinta Mountains was, millions of years ago, covered by an inland sea. Over vast time, mountains began to grow, stretching and compressing the crust, but this area remained dominated by the Green River Basin to the north and the Uinta Basin to the south, both of which absorbed the tectonic activity and did not budge. 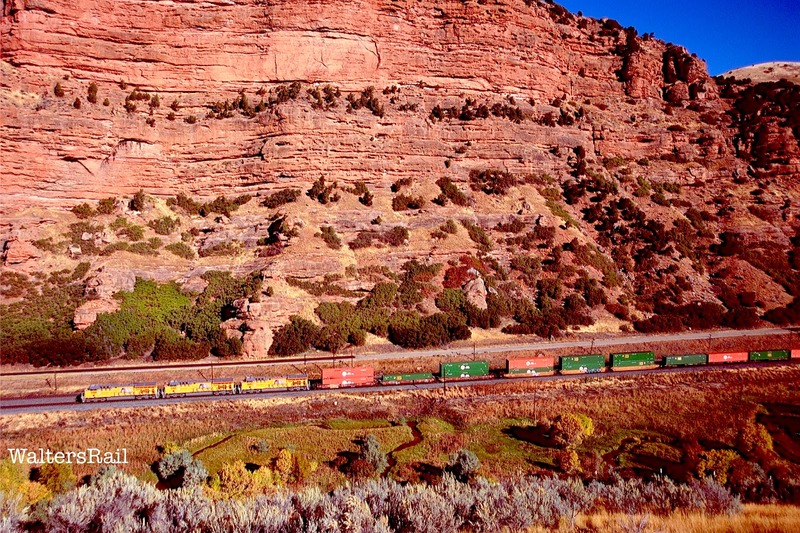 Eventually, the plate forces grew so strong that the border between the two basins buckled and folded, pushing skyward in what is today northeastern Utah along the southern Wyoming border. The tallest peak in Utah – King’s Peak at 13,528 feet – is found here, as well as several other spectacular mountains. 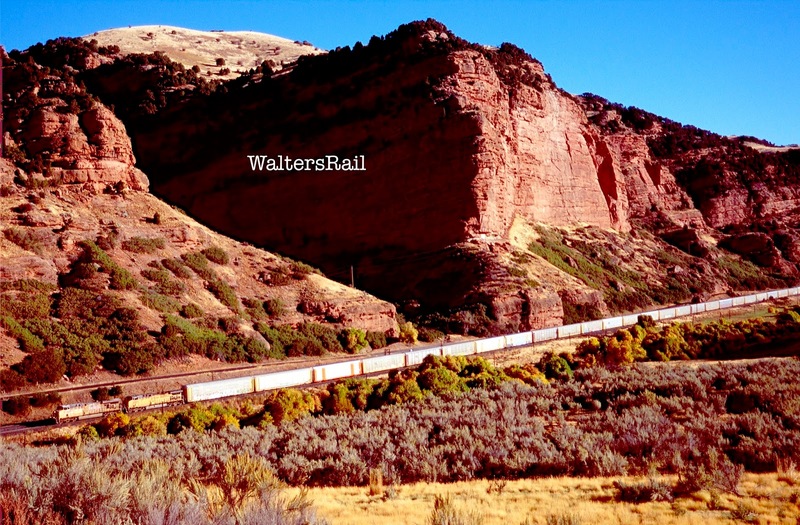 The foothills extend northward into Wyoming, which is where the Pony Express and later the Union Pacific chose to cross at Aspen Mountain. Aspen is an area of dry foothills with little vegetation beyond grasses and Mountain Cedars that grow no more than 15 feet tall. Here and there a few Aspen groves have managed a foothold in crevices shielding them from the fierce winds. There is a minimum maintenance road across Aspen Mountain, and local ranchers have told me that it follows the route of the original Pony Express. The grade is much too steep for the railroad, however, so the UP was forced to tunnel. If you have a sturdy, four-wheel-drive vehicle with high ground clearance, you can follow the road almost to the top of the mountain, where you will find a large gate and sign making it clear that you are trespassing beyond. If you reach the gate, however, you can turn left and follow what now amounts to a cow trail down the slope to the mouth of Altamont Tunnel, the second tunnel beneath Aspen Mountain. Aspen Tunnel was the first, but in 1949 when traffic became too heavy, UP constructed Altamont Tunnel to the north of the original bore. At 6706 feet, Altamont is the UP’s longest tunnel east of California, and at 7268 feet it is the second highest point on the UP’s transcontinental line after the summit at Sherman Hill. 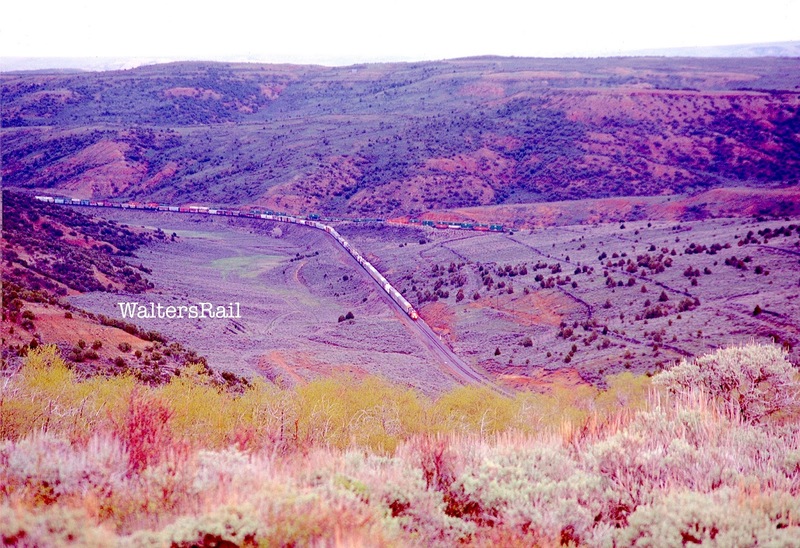 This was the last part of the transcontinental line to be double tracked. 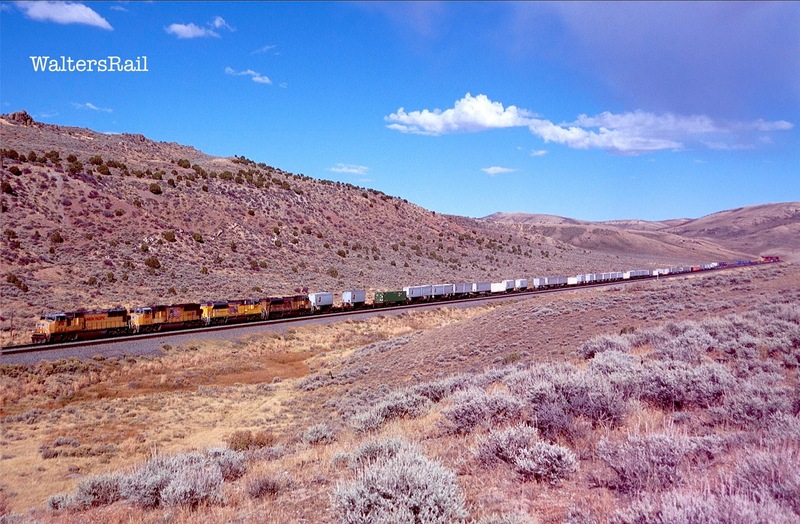 To reach Altamont Tunnel, take Exit 18 off I-80 and head southwest on a gravel road. At the first fork in the road, bear left. At the next fork, bear right. You will now be on Altamont Road, which will take you almost to the top of Aspen Mountain over land open to the public. Be warned, however, that the going is rough. The road is pock-marked with boulders and holes. On my first drive up this grade, I stumbled upon a young man and his wife, both of whom appeared to be in their twenties, who had broken the front axle of a Ford F-250 Super Duty, which is not easy to do. Their massive truck sat sideways in the road like a wounded buffalo. I drove them back downhill to Evanston, Wyoming, where they commandeered a wrecker, at some considerable cost, to pull their lamed vehicle back to town. By the time I made it to the top of the hill and the large “NO TRESSPASSING” sign, it had started to rain. 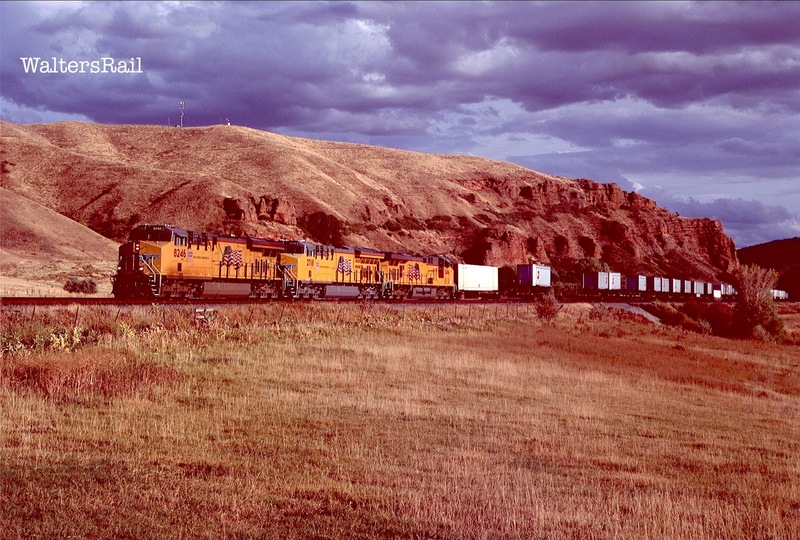 Looking to the east, I saw a broad valley through which were passing two Union Pacific freights, one in each direction. I jumped from my Jeep and took a “hand-held” shot in the rain. Directly in front of me was something that you could not exactly call a road. It looked as though it had once been a road, but time, wind and rain had reduced it to little more than a rut down the hillside. A normal person would have turned back, but I did not purchase my Jeep to turn back. I pressed ahead downgrade into the unknown. The trail, if you can call it that, was so uneven and filled with rocks that I turned off the stabilizer bar in my Jeep, which allowed the wheels significantly more articulation. As the right front tire went up over a large rock, the left rear tire sagged down into a mud-filled hole. I shifted to four-wheel-drive low and wondered what would happen if I made it all the way downgrade. Would I be able to make it back up in the rain and mud? About halfway down the hill, I passed a bulldozer which appeared to have been sitting silently through many winters. The hoses on the engine had rotted and fallen away. Yellow paint was peeling everywhere. Over the seasons, several ground animals had made nests in various portions of the metal frame. I am going to guess that the dozer had once been used by the UP to carve a road down the hillside into the east portal of Altamont Tunnel. The railroad left the dozer in place for infrequent use. After a while, it became a semi-permanent part of the landscape. It occurred to me that the same thing might happen to my Jeep. The Jeep continued bouncing downhill, pulled solely by gravity. I turned on the Automatic Hill Descent to allow the vehicle’s computer to handle breaking while I clutched the steering wheel. The grade became steeper, and the Jeep began to slide in the mud. I imagined it would be about a fifteen mile hike back to the Interstate. 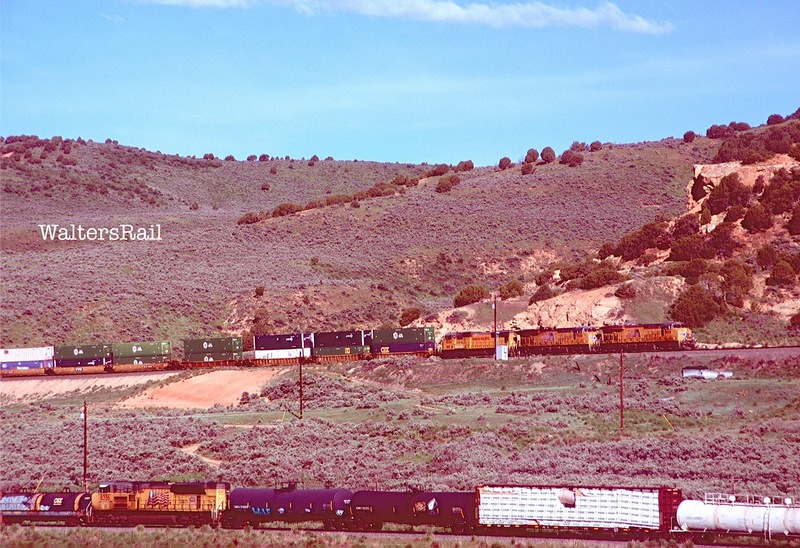 In front of me were the westbound Union Pacific tracks, curving toward the mouth of Altamont Tunnel. 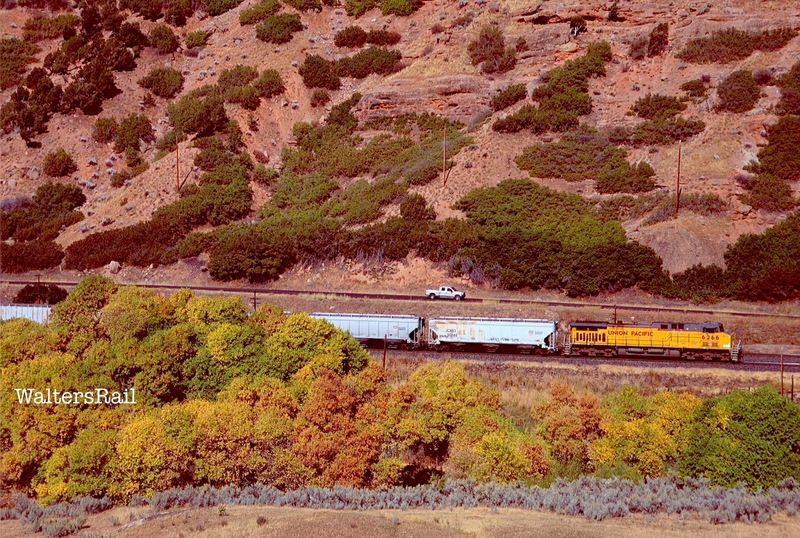 Beyond were the eastbound tracks coming out of Aspen Tunnel. The two tunnels are separated by a steep ridge, with the tracks diverging about a mile east of their east portals. On my first trip there in June 2016, the UP was installing Centralized Traffic Control to replace Automatic Block Signals. The CTC was not yet operational, so all westbound traffic used Altamont Tunnel, and all eastbound traffic used Aspen. 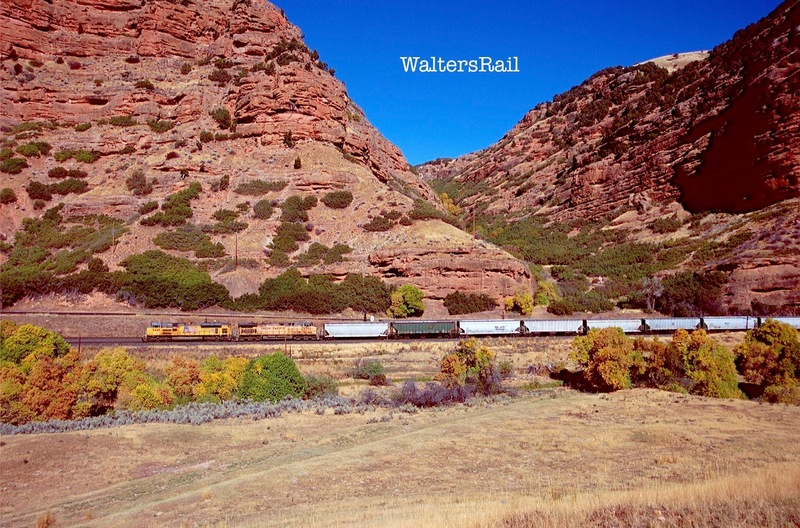 On my second visit in late September, 2016, the CTC was operational, and I saw several westbound trains using Aspen Tunnel. As my Jeep continued bouncing its way downgrade through the rain and mud, I saw that the east portal of Altamont Tunnel was guarded by what appeared to be a closed circuit TV camera. I may be wrong about that, but I did not want to take a chance (which is hilarious, considering I was sliding down a mountainside in the mud) so I did not drive to the mouth of the tunnel. 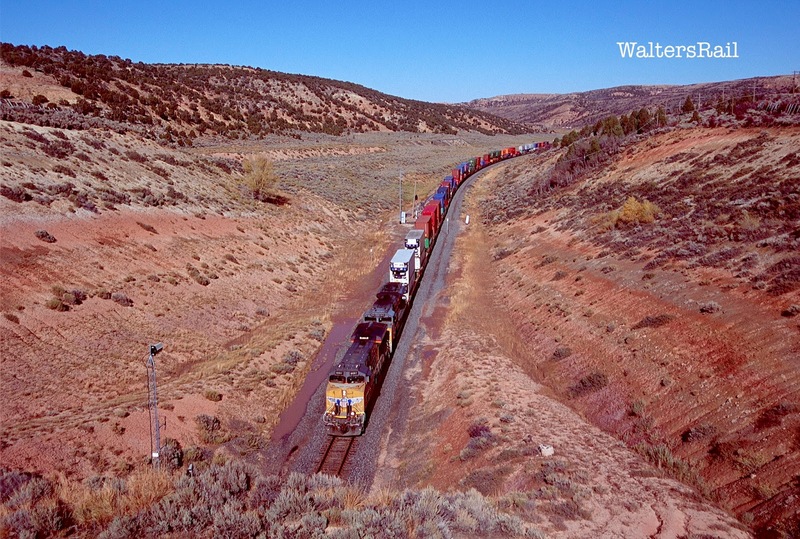 When I reached trackside, I stayed around the curve behind a steep ridge, out of sight of potentially inquiring minds. The rain was coming harder now, with a strong north wind swirling through the valley. 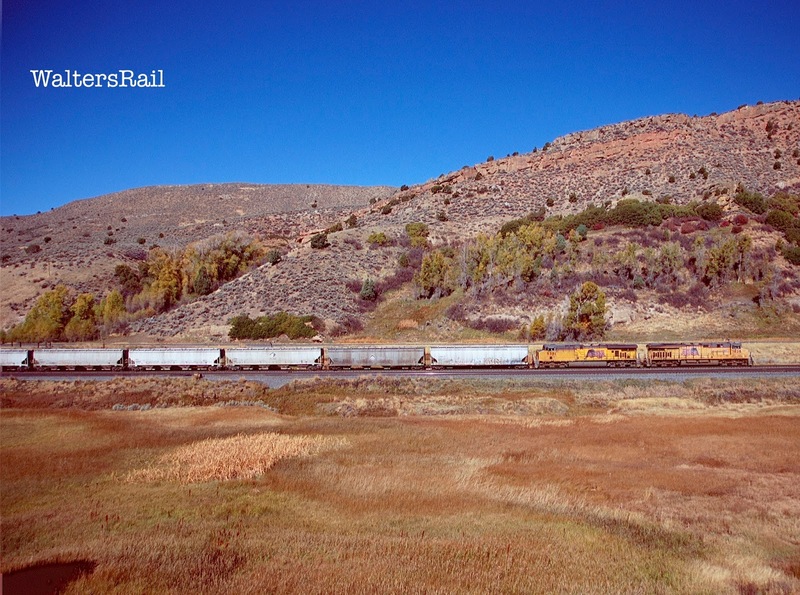 Railfanning has taken me to some isolated places, but this may have been the most remote of all. Here is where the post begins to sound like a Jeep commercial. To my amazement, I had no difficulty climbing – none. In four-wheel-drive low, the vehicle moved slowly and steadily upgrade, bouncing over rocks and in and out of mud holes, never slipping, never wavering. I was startled. I don’t know if I’m becoming a better off-road driver or if I am just repeatedly saved by Jeep engineering. Either way, that rainy day at Aspen Mountain emboldened me to see if I could find other access points to the twin tunnels. The answer is yes and no. From the west, a decent dirt road leads directly to the western bores, which are very close together. However, the road is gated about two miles short of the tunnels and framed with another large “NO TRESSPASSING” sign. You could walk along the tracks to the tunnel mouths, but I did not try that, in part because I assumed there would be more closed-circuit television cameras. South of the tracks, there are a series of primitive roads that will lead you to about three miles from the east portal of Aspen tunnel. From there, another hike along the tracks would be required. I passed on that adventure, as well. Perhaps another day, when the weather is better. 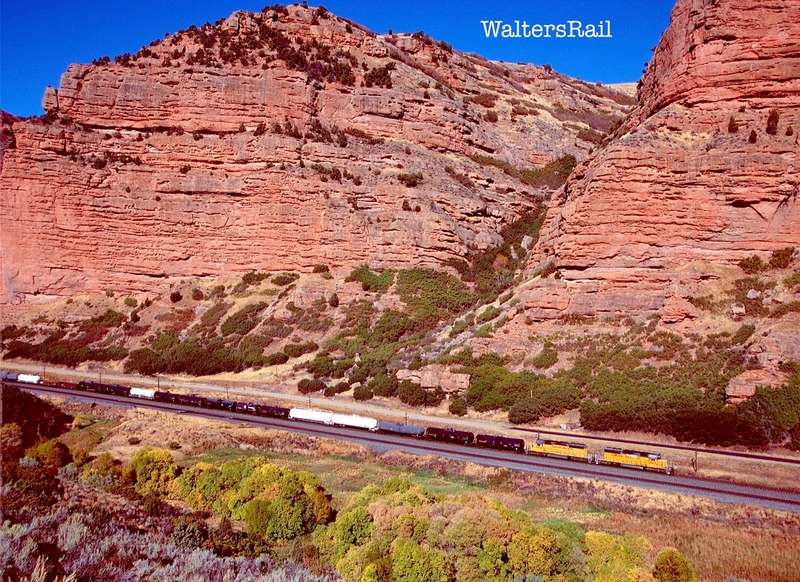 Located in northeastern Utah, just a stone’s throw from the Wyoming border, Echo Canyon unfolds in the transition zone between the Wasatch and Uinta Mountains. 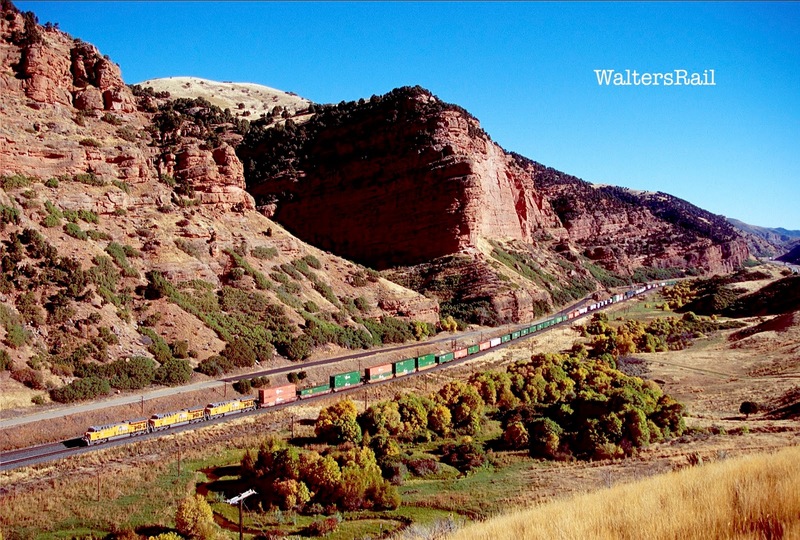 Maximum relief from the Wyoming border to the Henefer Valley is almost 4,000 feet, the difference in elevation of the Weber River, at 5,350 feet near Henefer, and the summit of Porcupine Mountain (slightly west of the southwest corner of Wyoming) at 9,200 feet. Sandstone cliffs in the canyon rise hundreds of feet. The color of the sandstone at dawn is burgundy, as though the landscape were drenched in Merlot. As the sun rises, the deep red lightens to almost tan, then darkens again as the sun disappears behind the western hills. Approximately 100 million years ago, western North America experienced a mountain-building period called by geologists the “Sevier Orogeny.” Pacific Ocean crust collided with, moved under and lifted the lighter continental crust of North America, sliding the North American Plate east, pushing rocks up and over adjacent layers, forming the Sevier Mountain Belt. As the mountains climbed skyward, the land to their east subsided, creating a huge basin stretching east to the western edge of what we now call the High Plains, running south to north from present day southern Nevada to Canada. Later, as the mountains eroded, sedimentary detritus flowed eastward and filled the valley. Echo Canyon was formed by the erosion of this detritus – the “Echo Canyon Conglomerate,” composed of sandstone and quartzite pebbles, cobbles, and boulders come down off the mountains. Wind and water have created the fantastic shapes we see today: Witches’ Bluffs, Pulpit Rock, Castle Rock, Devils War Club, Sphinx, and Sentinel Rock. What became of the Sevier Mountain Belt? It has eroded away to nothing, deposited as the sediment through which Echo Canyon navigates. Millions of years later, the mountain range that we call Wasatch began to form along the fault in the crust separating the North American interior from the extending, collapsing crust of the Basin and Range to the west. Across this boundary, Salt Lake Valley is dropping away to the west, sliding off of the Wasatch Mountains one earthquake at a time. These mountains stretch north-south across Utah from the Bear River in the north to Mount Nebo near Nephi in central part of the state. Most elevations along the range are generally between 9,000 and 10,000 feet; Mount Nebo is the highest peak at 11,877 feet. The Wasatch approach Echo Canyon from the west. To the south stand the Uinta Mountains. 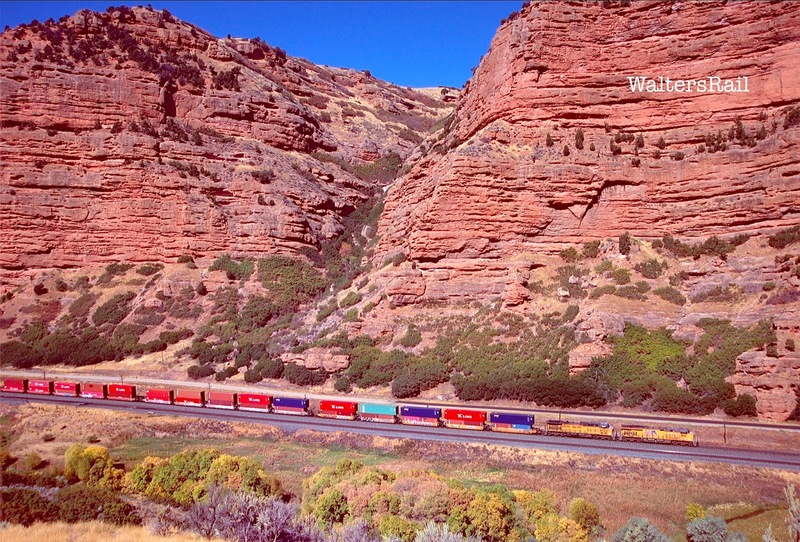 Echo Canyon is a passageway through these two mountain ranges into the Salt Lake Valley – the only passage traversable by wagon. The trail through Echo Canyon thus was important in westward travel. Buffalo and men, both native Americans and Europeans, used this natural gateway to the valley of the Salt Lake. 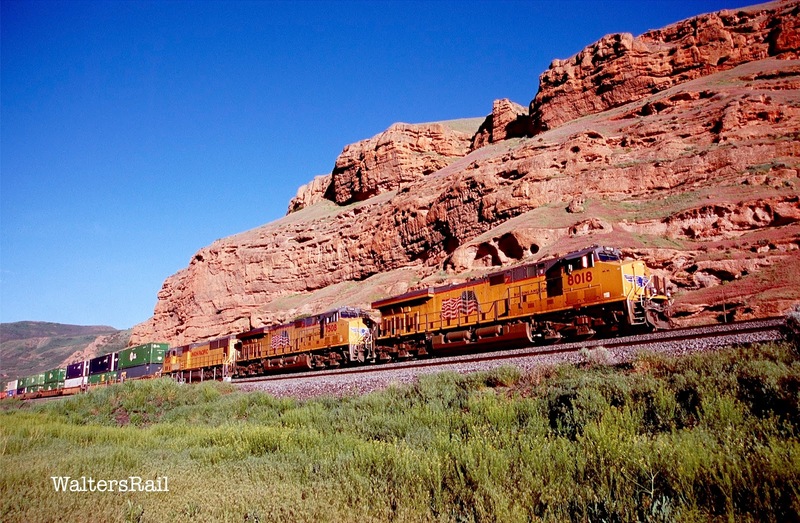 Wagon trains, Mormons, the Overland Stage, the Pony Express, gold prospectors and silver miners, the Union Pacific, the first transcontinental telegraph line, the Lincoln Highway and Interstate 80 all followed the same route. 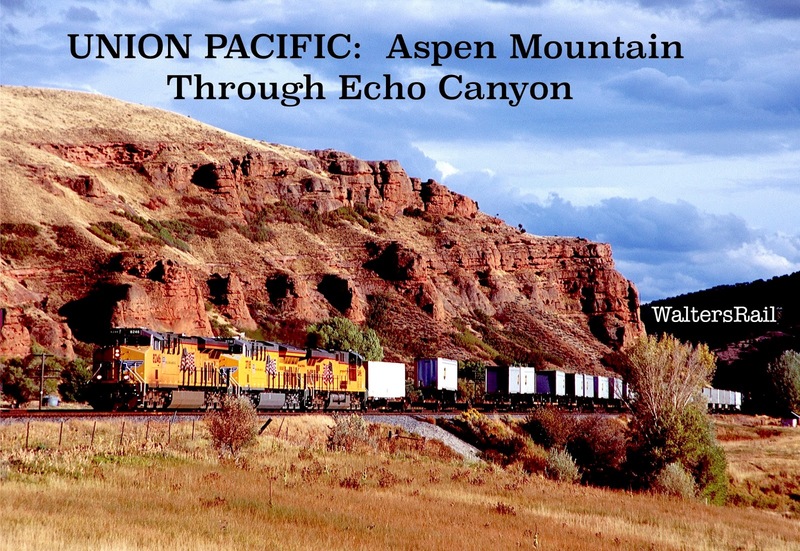 You cannot discuss Echo Canyon without reference to the Latter Day Saints, who began migrating West in 1847, following the same route as the Pony Express across Aspen Mountain, down through Echo Canyon to the valley of the Great Salt Lake. 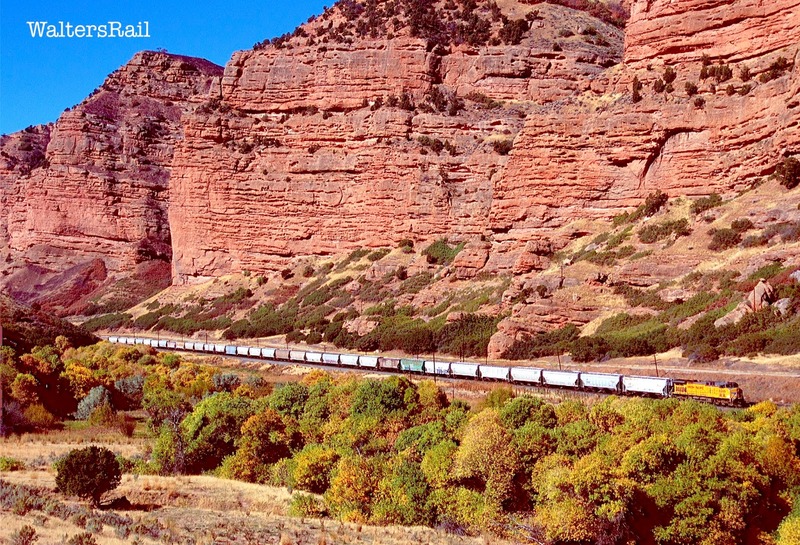 The Mormon Trail was used for more than 20 years, until the completion of the Transcontinental Railroad in 1869. Among the emigrants were the Mormon handcart pioneers of 1856–60. Two of the handcart companies, led by James G. Willie and Edward Martin, met disaster on the trail when they departed late and were caught by heavy snowstorms in Wyoming. In 1858, the U.S. Army was sent to Utah to quell the Mormon Rebellion and enforce laws prohibiting polygamy. A Mormon militia dammed Echo Creek with a rock wall and built fortifications, which as it turned out were never employed, but the stone relics can still be seen – if you know where to look. 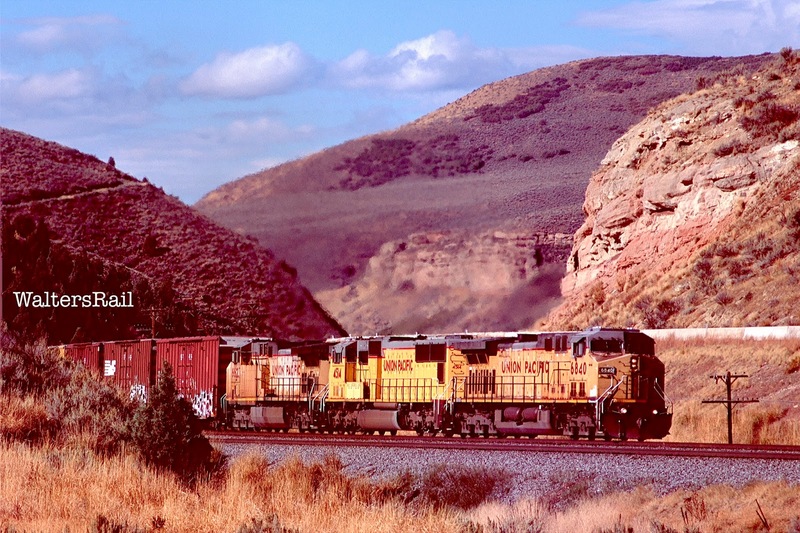 A little known fact is that much of the Union Pacific through eastern Utah was built with Mormon labor. 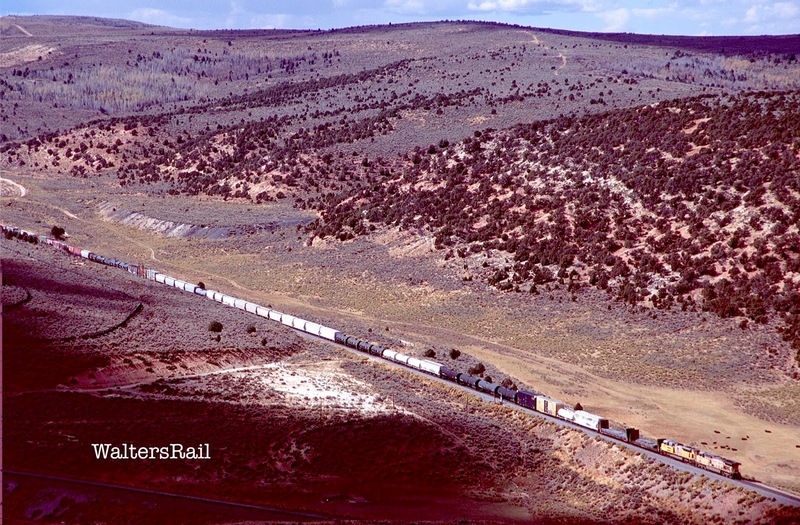 In 1856, Congress appropriated funds for improvement of the Oxbow, Santa Fe and Mormon trails, and civil engineer Frederick Lander was appointed chief engineer and field superintendent for improvement of the Mormon Trail, which later served at the route of the Union Pacific. 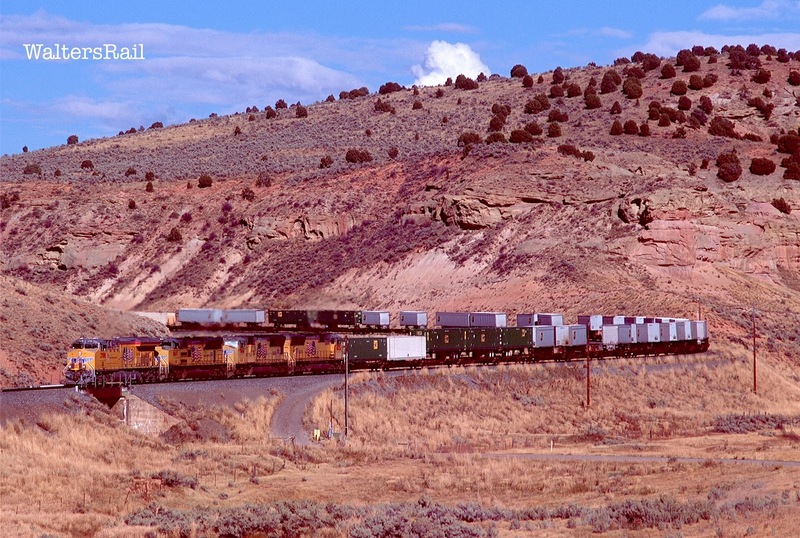 After the trail improvement work was completed and the Union Pacific had chosen the Mormon Trail as the route through eastern Utah, the railroad anxiously sought Mormon labor, horse teams, grading equipment, tents and other necessary equipment -- on a delayed payment basis. In other words, the Mormons did the work, and the UP, pleading poverty, agreed to pay at an unspecified date in the future. Really! For reasons I do not understand, the Mormons agreed to this outlandish proposal and built most of the roadbed from the Wyoming border to the valley of the Great Salt Lake. The UP then defaulted, and the Mormons were forced to file claims in New York and Boston and were ultimately paid only partially in materials rather than cash. Mormons also worked for the Central Pacific as it built east from Nevada. 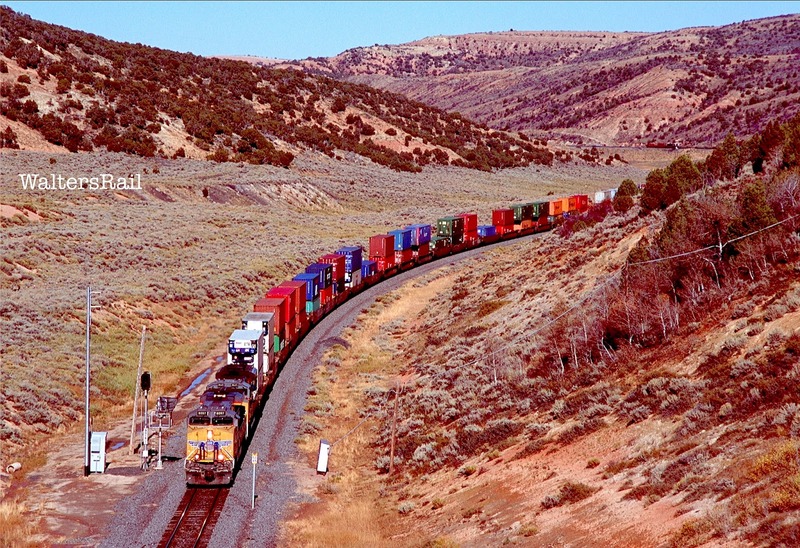 Each railroad was paid per mile, and for a time the CP and UP built past each other – because no agreement had been reached on where the two roads should meet. So in the final mad months of racing between Union Pacific and Central Pacific, Brigham Young and his associates held construction contracts with both companies. 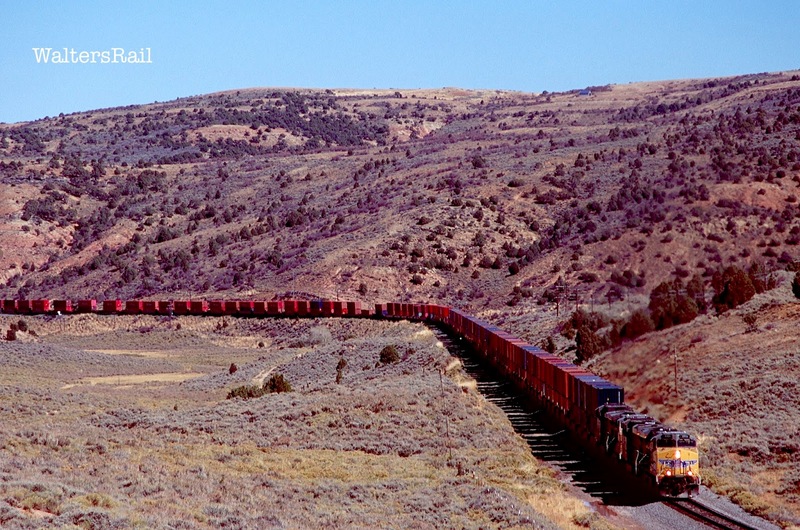 Mormons were grading two roads, closely paralleling each other, a distance of some two hundred miles across northern Utah, from Nevada to Wyoming, with non-Mormon crews to do the follow-up work of laying the ties and rails on each line. Neither company would agree to a meeting place, and each was anxious to gain as much mileage as possible. When U.S. Grant was sworn in as President, he told the two railroads to select a location where their tracks would meet. If they failed, he said, he would choose one himself. 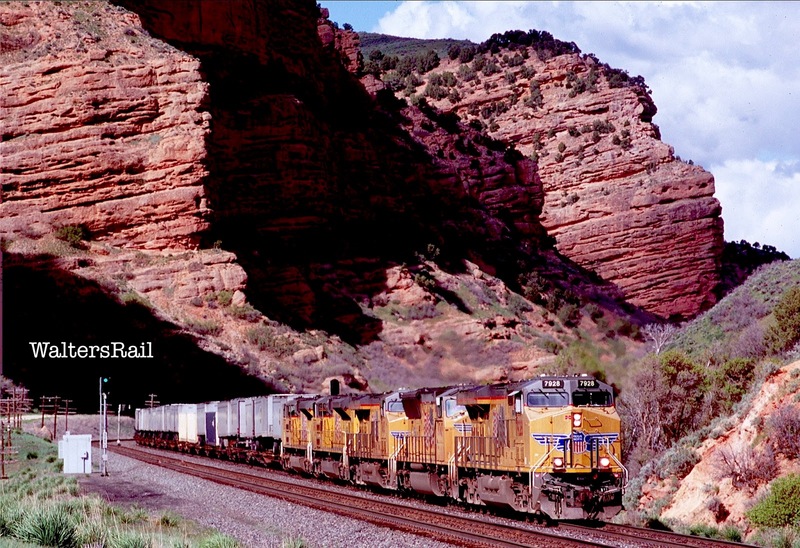 At this time, the Union Pacific was in financial turmoil, one of the reasons why the Mormons were not paid. The Central Pacific had obtained payment from the U.S. Government, but the UP was still waiting. So the Central Pacific had the upper hand. Representatives of the two railroads met at the house of Massachusetts congressman Samuel Hooper. 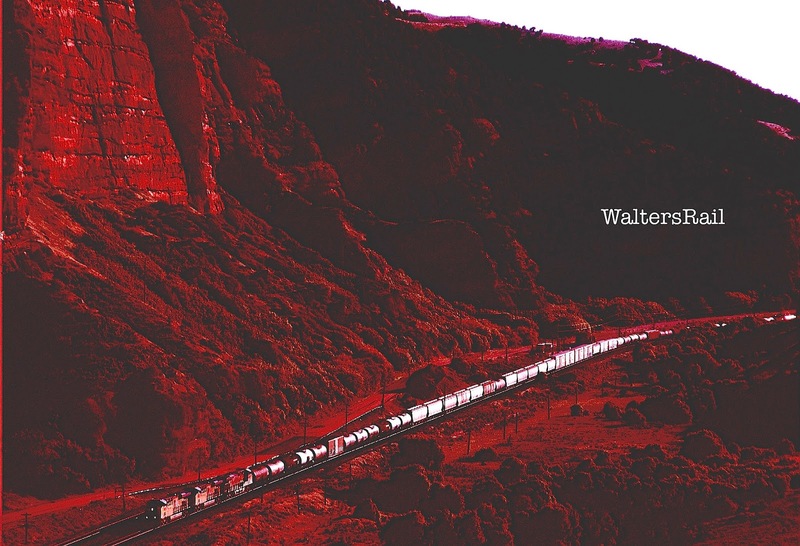 Negotiations – about which no one ever wrote – lasted through the night into the next day and produced the compromise “Treaty of Hooper’s House,” which selected the desolate Promontory Point, overlooking the north shore of the Great Salt Lake, as the junction of the two railroads. Construction through Echo Canyon must have been some of the most taxing on either railroad, with the exception of the route through the Sierra Nevada in California. 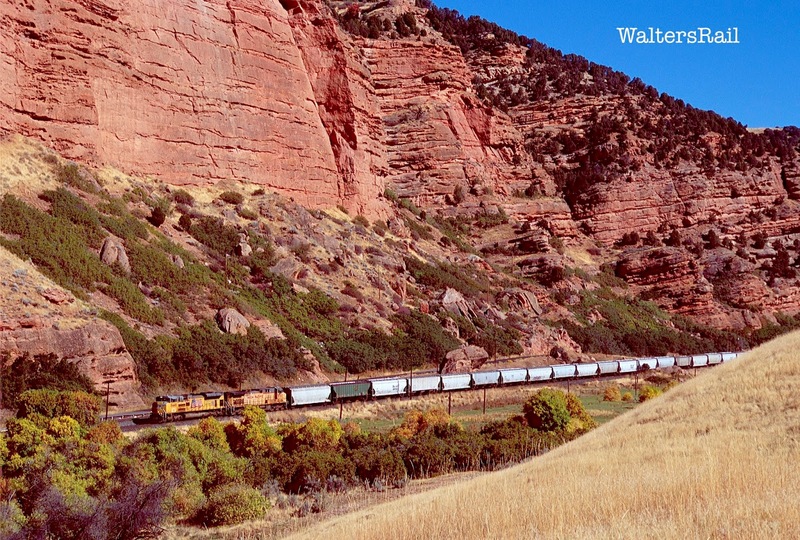 The original, single-track line came down from the Wyoming state line into the valley of Echo Creek, beneath towering sandstone bluffs, curving and winding narrowly between stream and rock. In sections of the canyon, the creek overflows during heavy rains, creating small, mini-swamps filled with ground water and cattails. One June morning, I naively wandered into one, submerging myself above the ankles. Bear, who had refused to follow me, stood on dry ground and watched with the sort of look my wife gives me after I have spilled something on a dining room chair. On another morning, Bear and I were waiting on a hillside slightly upgrade from the I-80 rest stop that provides some of the best photographic locations in Echo Canyon. You can park at the rest stop and climb a hill to a sitting area that overlooks the tracks – a nice place to take photographs if you don’t mind people walking up the path to the same hilltop and asking questions about your cameras and your dog. Having tired of the questions, Bear and I had moved away from the tourists. It was a warm, sunny morning in late September. The small trees along Echo Creek were turning yellow and red. Bear and I were resting in the grass, waiting for a train. Hearing a deep rumble to the west, I sprang to my feet and approached my tripod, expecting a train. Instead, to my immense surprise, a helicopter appeared above the hill upon which stood the rest stop. The bird was flying low, then swooping almost straight up, then plunging down again, then up again, trailing some sort of white mist. It suddenly dawned on me that the helicopter was spraying for bugs or weeds – something – and that Bear and I were directly in its path. I packed my equipment, and Bear and I beat a hasty retreat back to the rest stop's parking lot. Sure enough, the helicopter soon appeared over the area where we had been resting, dropping its cargo in long, misty sheets of white. We had just missed being bombarded with something -- I don't know what. If I, however, grow a third arm or a second head, I will let you know. If you have not investigated this portion of Wyoming and Utah, you should make the trip. 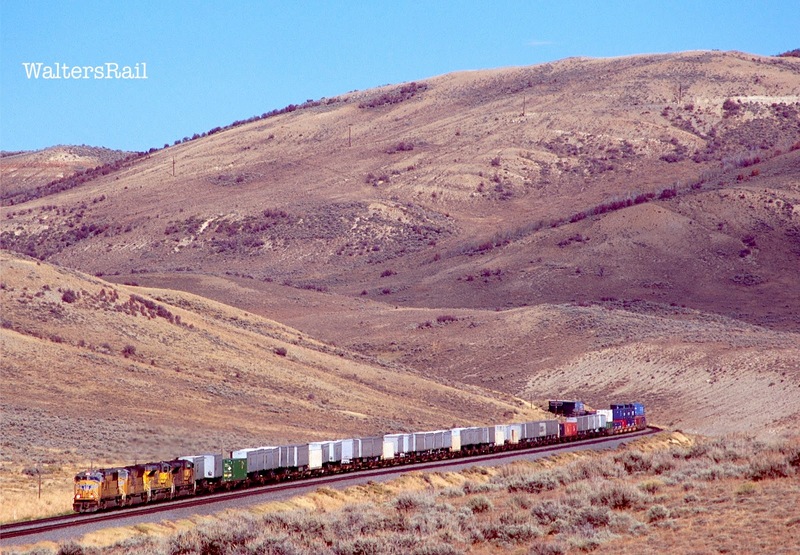 The scenery is spectacular, as is the history of this passage into the Great Salt Lake Valley. 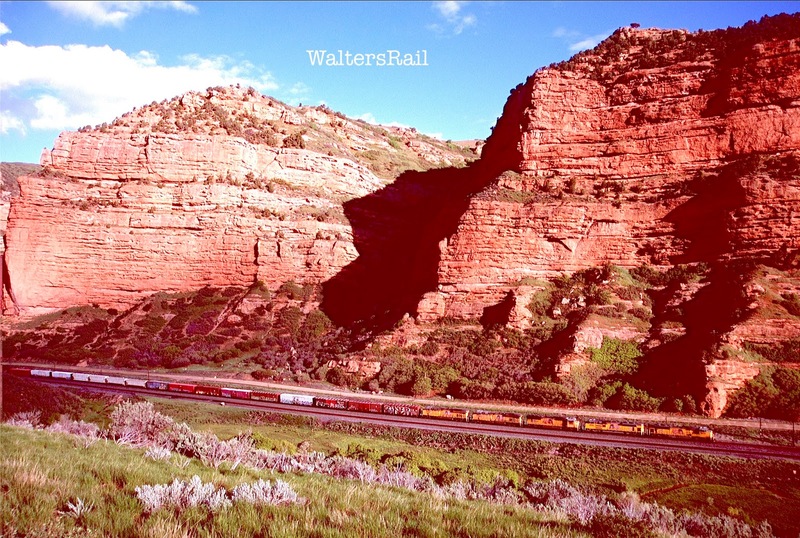 When I wait beside the tracks here, I close my eyes and imagine all the travelers on foot and in wagons who made this journey in the 19th century. I wonder if I would have been hardy enough to do the same. This is Raimar from Germany! 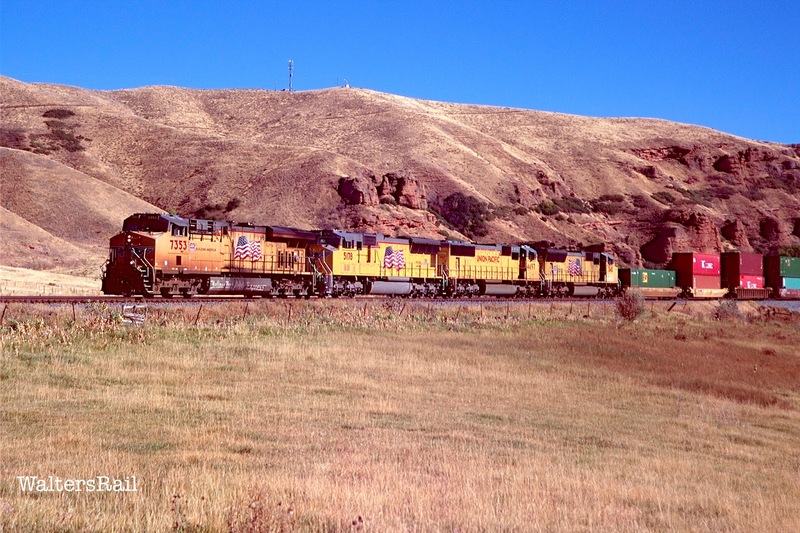 I was in the 90s a few time at Echo-Canyon to visit the Union Pacific. 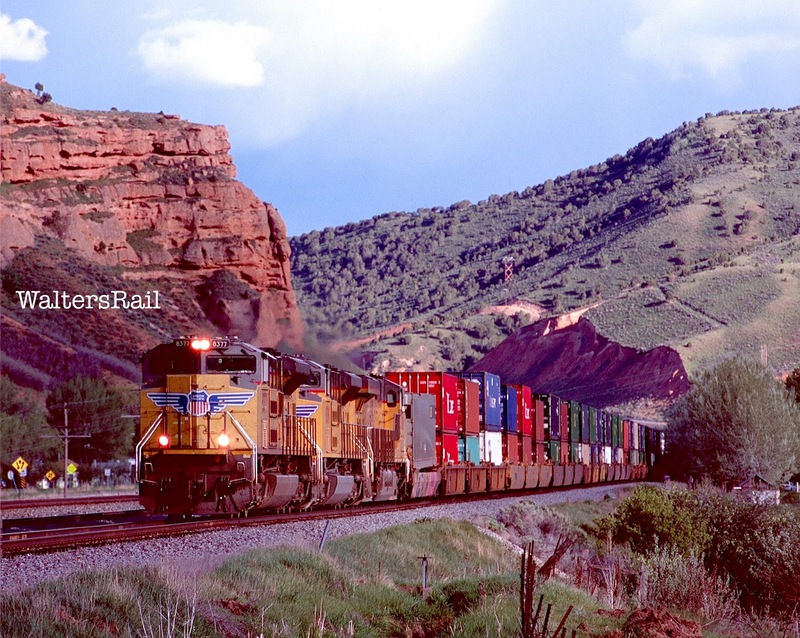 Traveltime is over, my Echo-Canyon Model Railroad don`exist anymore and so your images were a wonderful reminicense to old times.